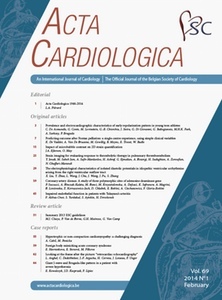 Acta Cardiologica is an international journal. It publishes bi-monthly original, peer-reviewed articles on all aspects of cardiovascular disease including observational studies, clinical trials, experimental investigations with clear clinical relevance and tutorials. Acta Cardiologica is abstracted and indexed in the Science Citation Index Expanded; Current Contents/Clinical Medicine; Medline/PubMed; Biological Abstracts; BIOSIS Previews; Scopus; CrossRef; Thomson Scientific Links. Acta Cardiologica is a peer-reviewed journal.